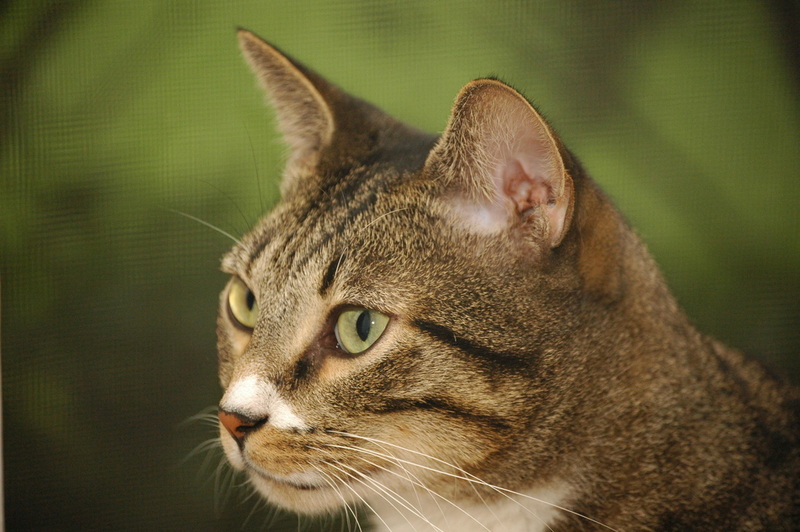 In September 2011, I got My Really Big Wakeup Call on feline oral health. With the usual caveat that you should remember that all this comes from a layperson, not a vet, I wanted to offer up a summary of the Three Big Takeaways driven home to me after I bit the bullet and took Wilson to a veterinary dentist to address his gum inflammation. After viewing the photographs taken by the vet of my beloved Wilson's mouth, seeing the x-rays, sitting through the consultation and post-operative chat following his surgery at the hands of a gifted veterinary dentist - and coming home with a much lighter pocketbook and a cat who had to endure four extractions and who had obviously lived with much more pain than I could have imagined? 1. You can't treat what's wrong if you can't see or access it. 2. Brushing teeth really isn't optional. 3. Anesthesia-free pet dentistry is a very, very, very bad idea. As a bit of background first: Wilson came into our lives when he was about 4.5 years old. I had virtually no information on his medical history, so I had no way of knowing if he'd had dental cleanings before or the benefit of any past x-rays to snag even a small clue as to the source of the gum inflammation and tenderness in his mouth discovered during his "welcome home" checkup. My reticence about putting a cat under anesthetic - unless someone had a gun to my head or there was a compelling and obvious reason to do so - resulted in my not paying close enough attention to the issue of cat oral health. With 20-20 hindsight, if I was so afraid of anesthetic, then I should have been brushing all my cats' teeth daily since they were kittens. Moreover, I have grown so suspicious of what "the experts" told me for years on so many areas of cat care, that it was easy to tell myself that their admonitions about the need for regular professional dental exams were not to be taken any more seriously than their advice on how to feed cats. Let me explain and make my excuses first. I spent years happily oblivious to a cat's obligate carnivore status, had placed de facto blind trust in the pet food industry, and assumed that if a vet said it was okay, it must be okay to feed grain-laden dry food. Besides, I figured, hey, everyone does it and if kitty doesn't seem overtly sick, then all must be well. It took my ending up with a kitty with inflammatory bowel disease to wake me up to the whole world of cat nutrition. But? Here's the rub and what worked as my excuse up to now: my reflexive aversion to and resulting distrust of so much of mainstream veterinary medicine, midwifed by my intense frustration with and sense of betrayal over their endorsement of sub-standard nutrition, made it easy to look the other way on the value of their advice on other matters. Like, um, sound dental health for cats. It took a sobering, stressful (for me), and expensive experience with Wilson in September 2011 to wake me up to the profound importance of safeguarding a cat's dental health and to begin my education in earnest on how to approach dental cleanings and tooth brushing. This one is a bummer. If your vet examines your cat's mouth and everything looks okay, you might assume there's no need to do anything more. It could be that this is exactly right. But? The odds are higher than most of us care to believe that kitty has periodontal disease (PD). According to the detailed paper that board-certified veterinary dentist Dr. Thomas Chamberlain shares with his clients, approximately 85 percent of cats and dogs have PD by the age of two. That means only an estimated 15 percent of cats have reasonably healthy mouths. Those are really really REALLY crappy odds. Darn it all to heck, huh? And most cats eat dry food - so obviously, dry food isn't helping prevent periodontal disease. I'm not wedded solely to numbers as a guideline for gauging my cat's health or deciding what I should or should not do for them, but that's a sobering statistic. What I still don't understand - and what remains bafflingly unclear even from the available studies and research out there - is why domestic cats are so terribly prone to PD. From everything I've read, cats on superb diets can have great teeth or horrible teeth. Cats on lousy diets can have great teeth or horrible teeth. We just really don't know. What we do know is that the only safe, humane, and reliable way to determine if a cat has PD is to put the cat under anesthesia. Because it's only under anesthesia that a vet can assess what's going on under the gums. And it's only under anesthesia that we can get the benefit of x-rays, an incredibly valuable tool. It's only under anesthetic that a veterinarian can clean beneath the gums (the subgingival area if you want to get all scientific-y in your language) where hardened dental plaque (calculus) wreaks its most serious havoc. I wish all this weren't true, but it's also only under anesthetic that a vet can find periodontal pockets and clean (debride) them. Put simply, the most serious issues that need to be addressed to keep a cat out of pain and with a healthy mouth lie beneath the surface. Oh I know, I know, believe me. This one overwhelmed the daylights out of me too. Theoretically a great idea, but impractical and unrealistic, right? The very idea of brushing a cat's teeth every day sounded about as realistic to me as the suggestion in those 1950s "how to keep a perfect house" magazines that insisted that one should be removing the hanging light fixtures every week to dust them so they'd always sparkle. Nice idea, but are you kidding? Who has the time? And good golly, we're talking about cats here. Cats hate being messed with. Am I really going to ever persuade a cat to let me put a toothbrush in his mouth and expect to emerge intact and without deep scars on my hands and forearms from being shredded by a really ticked-off feline? I've lived with some pretty relaxed cats, but come on already. I bought toothbrushes for cats years ago and after dedicating a whopping three minutes to trying unsuccessfully once or twice, let those toothbrushes sit in the same drawer where all my other "had good intentions but oh forget it already" household goods sat collecting dust. Okay, and I'll admit this as well: brushing a cat's teeth seemed pretty unnatural. Since when does a cat in the wild pause during the day to whip out a set of bristles? I recall a time when I thought the idea of making all my cat's food was absurd. But now I can't imagine feeding them any other way. I've slowly come around to the same notion with tooth-brushing. I used to tell myself, "Hey, if I can't brush their teeth, no biggie, because if their teeth need attention, I'll take kitty in for a dental cleaning and that will take care of everything." Again quoting the awesome handout from Dr. Chamberlain: ". . . pet owners often have unreasonable expectations about what the veterinary dentist can provide from a professional cleaning once every year or two." Why? As the veterinary dentist handout I got says, "The gold standard of home care remains brushing teeth." Until we have the answer to how to reliably prevent plaque from building up on a cat's teeth within a dizzyingly small number of hours after a professional cleaning, the only reliable way to keep it at bay is with brushing. Sure, there are other strategies that can definitely help support dental health - feeding large chunks of muscle meat, steering clear of feeding sticky-plaque-mess-on-the-teeth inducing dry food - but those alone aren't enough. I wish they were, oh believe me, I wish they were. But they're not. My vet reported to me after Wilson's dental surgery that while he was under anesthetic, poking around in one area "induced reflexive sensitivity." Oh man. Those are clinical words for "there is so very much intense pain here that even with anesthetic this sweet boy's body is reacting to the hurt when he's sedated." That is not what you want happening for your cat. Ever. When you read or hear that "cats hide pain well" or "cats have high pain tolerance" - sit up and take notice. Do you want to "tolerate" pain? No! Nor does your cat. Don't confuse "pain tolerance" with "pain doesn't hurt the cat." Kitty doesn't have a choice if there is nasty stuff going on that he can't do anything about so he accepts it and moves on as best he can - that's what "pain tolerance" means. The source of pain should be addressed. And once it is, the best insurance against its recurrence is tooth brushing. Cornell University has a terrific video on how to approach cat tooth brushing using a four-week program that incrementally introduces cats to tooth brushing. Now they have it - but charge for it. I began brushing my cats' teeth (finally!) in 2011 and it's much less of a big deal than I'd presumed. No joke. I pretty much followed the guidelines and tricks on that Cornell University video, though I find that tooth-brushing is more hassle-free around here if I catch the critters when they're asleep. They're two fairly mellow guys and seem to take to it well. With my young six-month old kitten, I found that I could sneak in toothbrushing during a snuggle session when he is on his back letting me skritch his head and rub his belly. He's so blissed out that I can sneak a brush in his mouth and swipe-swipe-swipe and brush those teeth before he's even noticed what I'm doing. But hey, that's Sidney-Beans. Every cat and every kitten is different. Remember - you do NOT have to brush the inside of the teeth, only the outside -- and really all it takes is some swift, repeated swipes of the upper and lower rows of teeth (including the front teeth). We use seafood-flavored cat toothpaste here and it seems to be a hit. With an adult cat, never begin brushing their teeth before kitty has had a thorough dental examination under general anesthetic first. If there is a painful condition going on, tooth brushing can cause serious pain to inflamed gums and set you up for trouble. The cat will be miserable and this will set the tone for a battle over brushing that will very likely cause you to give up. That cat will associate the toothbrushing experience with pain and your odds of having a successful life of tooth brushing going forward are almost nonexistent. Take kitty in for a professional exam under anesthetic first; when your vet gives you the "all clear" to begin brushing, then start with the early steps suggested in that Cornell video to get your cat incrementally adjusted to tooth brushing. Never use human toothpaste on a cat. Use a bit of toothpaste designed for cats. Set yourself up for success and find the brush that works for you. I think the the C.E.T. Mini-Toothbrush is the handiest and most user-friendly tool around to make it ergonomically comfortable to brush a cat's teeth. But I've also used the regular C.E.T. toothbrush and like that one too. Be patient and go slowly. Keep your eye on the big prize, which is to gain enough trust from your cat to do this by virtue of having slowly acclimated them to the idea that having a human do this is a normal, non-traumatic, and not unpleasant experience. Be willing to accept that at first, the most you'll get away with is maybe a few seconds of having your fingers or a brush near their mouth. Don't push it or rush. Be consistent and disciplined in doing this a little bit every day. And reward kitty with ample kisses and skritches during and after a session. Your patience will pay off. So do your cat a favor. When you have the green light from your vet to begin - brush his/her teeth. All the very coolest people are doing it. I know I'm adamant about the whole cat nutrition thing, but you knew me, you'd know that I generally steer clear of being overly strident and insisting that what I've come to regard as a "best practice" for cats the only choice for everyone. Heck, there's so much I don't know. I recognize and appreciate that being adamant and immovable on any subject turns people off, makes them defensive, and implies that I have all the answers. But on this one? I'm going to be tenacious, unwavering, and unrelenting - and resort to using all caps. DON'T HAVE YOUR CAT'S DENTISTRY WORK PERFORMED WITHOUT ANESTHETIC. I beg you to not let your cat become a victim of the new cottage industry that's appeared offering "anesthesia-free dentistry" for pets. It sounds so alluring. I don't know of any cat caregiver who embraces the idea of putting their beloved animal under general anesthetic if there's an alternative. I get it. But performing dental cleanings when a cat is awake is ineffective at best and pain-inducing at worst. Where did the idea come from? According to an item published online by Dr. Brett Beckman, a Diplomate in the American Veterinary Dental College and a Diplomate in the American Academy of Pain Management, "This bizarre practice originated in grooming facilities as a service to supplement income despite its negative impact on the patient." He adds, "As sad as it seems some veterinary practices have adopted this practice for similar reasons." Recall what I mentioned above - my very sweet Wilson wasn't pawing at his face every day or exhibiting any pain I could detect. I didn't know he was in a state of chronic pain. But even under anesthetic his sweet little furry body flinched when the doc was probing around one particularly nasty area in his mouth. I shudder to think how much pain that would cause a cat enduring poking and prodding that was wide awake. Aside from the significant pain for a cat - and remember, cats hide pain effectively - it's unsafe for the vet and it's unsafe for the cat. And, again, to repeat myself over and over again redundantly by being repetitive to the point of driving you nuts let me say this one more time yet again, a vet cannot treat a problem that cannot be seen or accessed. A vet cannot address issues beneath the gum line with a superficial cleaning of only the part of the tooth that is above the gum. Finally, when a cat's teeth are professionally cleaned under anesthetic, the veterinarian is able to use an ultrasonic scaler and a high speed polisher to smooth the enamel to ensure that that bacteria can't easily re-attach to a roughened surface. This isn't possible during a cleaning that occurs while your animal is awake. Anesthesia-free dentistry has the potential to really hurt your cat. Please don't unnecessarily subject your cat to pain. Please. Insert multiple exclamation points here.